In my continuing role as the Jiminy Cricket of IT Service Management, I frequently find myself pulling the reins in on the futurists, and pushing the traditionalists along. My take on the role of automation fits that perspective very well. A recent tweet by Mark Kawasaki got me thinking about the role of automation in ITSM, as well as the broader field of Customer Experience Management. Keep in mind that I work for a process automation software company, so apply appropriate filters as you see fit. Anyway, here's the original tweet. Mark is a talented and insightful ITSM thinker. If you don't follow him, you really should. As much as I would love to agree with his tweet, I have some reservations that are more than minor clarifications. First, automation efforts frequently remove human interactions that customers may well want. Second, and more important, is that decisions around automation tend to have more to do with cost savings than customer experience. I believe it's inherently dangerous for service providers to assume too much about their customers. Yes, those of us in the tech community tend to view human interaction, especially in regard to customer service, as a roadblock. It's the "I know what's wrong with my cable service, please don't make me jump through customer service hoops to schedule a service call" mentality. Is that true for all customers? Are we forced to go through human customer service just to cater to the lowest common denominator? Maybe in some cases, but I doubt that's true most of the time. I am suggesting, shockingly, that IT pros may not be the best judges of the value of human interaction in customer service and service management. Just as shocking: your CFO may not be either. I think of the credit card commercial from the past year or so, where a guy on a beach is calling customer service while walking on a lonely beach at sunset. I tried to find a link to the commercial, but I can't find it. Feel free to add it in the comments if you do. Anyway, as soon as the line starts ringing, the guy starts hitting buttons on the phone, only to discover that he's talking to an actual live human being. The point of the commercial is that, for specific card programs, you can talk to a person instead of going through the IVR system. The guy is pleasantly surprised, as would be the intended audience of this commercial. Before you automate, make sure you are not removing something your customers like about you! My point is this: Why do you want to automate something? If your primary reason is not improving customer experience, start over. Period. Even if the primary reason is improving the customer experience, how do you know? Are you rationalizing a decision that's really based on cost savings? We are in an "IT cost-savings" phase for many enterprises. 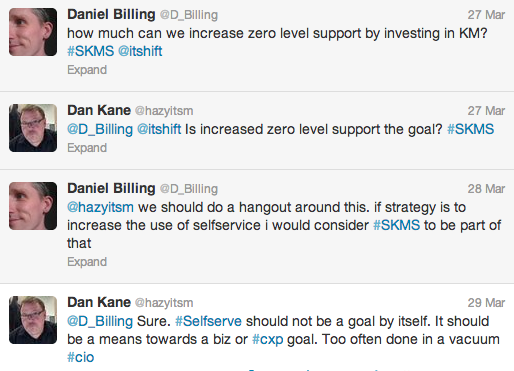 We talk about business-enabling ITSM initiatives, but how often is that really true? CIOs are under tremendous pressure to reduce costs, while innovating at the same time. Most of us find innovation difficult, and even harder to explain to your business partners unless it comes from them. Cost savings, however, live in the very core of the modern CIO. They were bred on cost savings and efficiencies. We're not so good at identifying the customer experience impact of cost savings efforts, and business partners tend to be distrustful of IT attempts to show negative impacts of decisions. Heck, IT always says the sky is falling; what's new this time? Don't guess at how an automation decision will impact customer experience. Make marketing your friend. Make Sales your friend. Ask them what is most important to the customers. Ask what their short and long term goals are. Describe what the automation will do in regard to the customer experience, and ask them to tell you the likely impact. Automation of all forms can provide amazing benefits, and it must be applied judiciously. Make sure it is done for the right reasons, and with the right measures of success.